One of the most characteristic features of large ice moons is the presence of long linear structures. The most logical explanation for these long linear structures is that they represent cracks or fractures – several thousands of km long – that guided the rise of new ice from within the moon toward the surface. Ganymede is a different kettle of fish. Its surface is generally scarred by impact craters so it is pretty old. In addition you can clearly make out two different kinds of terrain: (i) a darker ice terrain that is heavily cratered and therefore old, and (ii) a lighter ice terrain that while battered by impacts, is less so than the dark terrain, and therefore is younger. Notice the way in which the dark terrain looks like it has been cracked – rather like plate glass – and the cracks seem to have dilated, or opened up, to let the light coloured ice flow into the gaps. Starting with a close-up of Europa, these linear features are not simply cracks in the surface ice; they have a finite thickness and internal structure that you can see as stripes. In addition, they have a brownish colour that differentiates them from the dominantly blue ice that surrounds them. First, there’s a central valley, deep enough to be in shadow, that runs down the middle of the ridge (hence, such ridges are called triple bands or tribands). Second, the ridge truncates - or cuts across - all the older structures in the ice to either side, which includes simple ridges and an older triband. Third, the ice structure on either side of the principal ridge is totally different. In other words, the ridge is a boundary between two different ice domains. If it started as a crack or fracture, then some movement must’ve occurred along it to bring such different domains together. In brief, from the way in which ice ridges or tribands cross-cut one another, we can work out a time sequence or history of fracturing of the surface of the ice moon. Sometimes the history can be pretty complex, resembling a "spaghetti junction", but it can still be deciphered. In close-up, the internal structure in some swaths is not parallel to the swath boundaries - and may deflect towards them - telling us that the swath of young ice was associated with sideways motion. Geologists refer to these structures as “shear zones”. In contrast to Europa, Ganymede show lots of evidence for impact cratering – so its surface is older than that of Europa and is divisible into an older darker terrain and a younger lighter terrain. However, like the surface of Europa, Ganymede is characterised by the presence of long, linear fractures and ridges in the younger terrain. Given that Ganymede’s surface is older than Europa’s, this tells us that similar geological processes have operated in the icy outer moons throughout the history of the Solar System. In a close-up view of the boundary between old and young terrains on Ganymede one can clearly see (i) the greater density of impact craters in the darker older terrane, (ii) the sheets of lighter, younger ice that were injected along fractures into the edge of the older terrain, and (iii) the complex ridges and grooves in the younger terrain. In broader views of the boundary between old and young ice terrains, one can see an obvious 500 km scale vein of young terrain cutting across the older, heavily cratered terrain. Long ridges occur in the light coloured younger terrain, but also broad swaths of new ice with internal parallel grooves. See how the swath located along the terrain boundary cuts across the other ridges and grooves in the rest of the younger ice. Careful examination (red boxes) also reveals large chunks of old dark terrain floating in the younger grooved terrain and how the ridges and grooves follow the outlines of the chunks of older ice. The bottom line here is that – just like on Europa – we can establish a dynamic time sequence by observing the surface relations, even on an old and battered surface. A close-up image of Ganymede confirms that wide swaths of young ice show the same internal structure of closely spaced ridges and grooves as seen in the examples from Europa. How do these wide swaths form ? Two large swaths of young ice on Ganymede both cut older heavily cratered ice. The E-W swath cuts right across the N-S one, so it’s clearly younger. The classical model for ridges and swaths of new ice is that they formed by fracturing of older ice and the injection of new – perhaps slushy - ice from within the moon. In this case, where the swaths are about 500 km wide, the classical interpretation implies that the walls of the fractures must’ve moved apart by 500 km to make room for the new ice. However, another example from Ganymede shows a swath of new ice with abundant internal ridges cutting across an older impact crater (top image : yellow circle in lower image). If the walls of this swath of new ice had moved - either at right-angles to the swath (dilation), or parallel to its length (shear) – then the older crater should be distorted; it should no longer be circular. Yet, the crater is clearly circular. Therefore, the swath of new ice formed with no displacement of the older ice. This can only mean one thing: multiple fractures formed – probably sequentially over a period of time – with minimum displacements and channeled the injection of slushy new ice that digested the old ice and replaced it volume for volume. This presents a new problem : just because a swath of new ice is wide, we cannot assume that its width indicates the degree of dilation of the original fracture. So, the classical model may not be generally applicable. Let’s compare the long, linear features on the Jovian icy outer moons with those of Enceladus, a relatively small member of the Saturn family, about 500 km in diameter. Like Ganymede it has a relatively old terrain with lots of impact craters in much of its northern hemisphere, which contrasts with the southern hemisphere where the icy surface is very young, judging by the lack of impact craters. Like Europa, and the younger terrain on Ganymede, the southern hemisphere is decorated with long linear grooves, and bluish features referred to as “Tiger Stripes”. These are simply long, linear tribands – ridges with central valleys – that cut older ridges and grooves. In other words they’re ridges of young blue ice that cut somewhat older ice on either side. The current preferred explanation for these “Tiger Stripes” is that they represent geological faults – fractures in the moon’s ice – that slide back and forth as the moon is squeezed and distorted as a result of its orbital mechanics in Saturn's powerful gravity field. This back and forth sliding leads to what’s known as “viscous heating” localised inside the stripes, the same effect you can get if you rapidly bend a copper wire back and forth. If you then hold the bend in the wire against your skin, you’ll feel how much it's heated up. This is simply a more discrete version of the “Tidal Heating” that once dominated Ganymede and still drives the activity on Europa today. In the case of Ganymede and Europa the effect was spread throughout the volume of the moon instead of being concentrated in geological faults. Let's briefly summarise these pretty complicated structures that dominate the surfaces of the icy outer moons. The long, linear features of the ice moons come in two flavours – narrow ridges that may be simple or complex – and much broader swaths of new ice with complex internal structure. By examining the cross-cutting relationships, we can piece together time sequences, the histories of these features in any part of a given moon. The linears appear to form by a variety of mechanisms. All seem to start life as simple cracks or fractures. Some cracks appear to open (dilate) to allow the injection of new ice from below, but this is not always the case. Some linears show evidence for sideways motion (faults and “shear zones”). 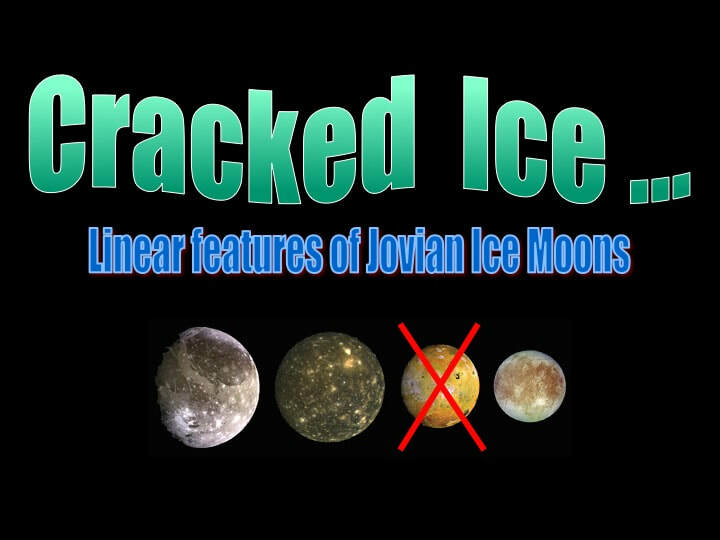 In addition to what they tell us about themselves, the way these linear features “refract” or change direction across major boundaries in an ice moon surface tells us something about the difference in the material properties of the ice they cut on either side of those boundaries. On the JPL Photojournal website, explanatory texts attribute these linear features to the dilation (opening) of the initial fractures that formed them. However, there are so many of these ridges and swaths on any given icy moon that the resulting bulk stretching of the moon’s surface would be enormous. If this were the case, then either parts of the moon’s surface had to contract in order to compensate for the stretching, or the moon had to expand like a balloon. Some of the JPL texts refer to “plates”, as in Plate Tectonics - the process that allows the surface of the Earth to both stretch and contract without the planet expanding. However there is no evidence for significant contraction on the icy moons. Planetary geologists propose that small moons such as Saturn’s Tethys or Uranus’ Ariel may have expanded by a few percent to create a few valleys that resemble “stretch marks”, but that’s very different from the massive expansion that would be implied by the features discussed herein resulting from fracture dilation and surface stretching. For this reason, I think that it's very significant that some swaths of new ice clearly cut across pre-existing impact craters - and replace them volume for volume - without distorting the shape of the remnant crater walls (as on Ganymede). This mechanism does not require much movement across the original fractures, and thereby removes the problem posed by the dilation and stretching hypothesis.